I don’t recall the issue I was facing; I was a teenager, so there were any number of them to choose from. Something, somewhere, contradicted what I believed and threatened to shift my entire worldview (or so my 15-year-old mind reasoned). My thoughtful, adolescent reply was something like, “I dunno,” when I was really thinking, I have NO IDEA! That’s why I’m asking you…THE PASTOR! That one response rocked my 15-year-old world. I had always relied on my dad for answers to deep Biblical questions–I would ask, he would answer, and I would go on with my life. I had been fine with that arrangement, and I was OK continuing it! There’s only one Truth on which we should build any belief: What does God say about it? It sounds so simple, so why does it prove to be so difficult? Let’s fast-forward about 25 years from the scenario above. I had allowed the daily demands of life to crowd out my regular discipline of Bible reading. I justified that I could coast on what I had “already stored up” through years of Christian school, Bible college, and working for a Christian publisher. But when you face a situation that shakes you to your core, you tend to go back to the basics. So over the last year and a half, I’ve discovered that my spiritual life is strongest when I feed it a steady diet of God’s Word. My spiritual life is strongest when I feed it a steady diet of God’s Word. Honestly, I still struggle with it. 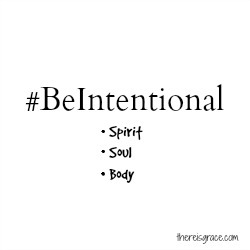 I have to #BeIntentional about not allowing other things to crowd out this vital component of my spiritual life. It’s not easy, but things of great value rarely are. We tend to make time for the things that are important to us. I can say I want to read my Bible all I want, but unless I determine when I’m going to do it, chances are it just won’t happen. I know you’re busy, I get it. My “when” has morphed over the years–as a young adult, I would read late at night before bed. When I worked full-time, I would routinely read on my lunch break. When my kids were younger, I tried to get up early and spend at least 15 minutes reading my Bible before the rest of the house was up. Now that my kids are older and able to get themselves up and ready, I have a little more time in the mornings to read and reflect. However, life is messy and it doesn’t always happen before we are needing to get into our school day. On those days, I plan a specific time later in the day for it or read a chapter with kids so we can discuss it. There is a specific spot in front of our fireplace where I like to settle in to read. I keep my Bible, a devotional, my journal, and a pen within reach. Settling into that spot triggers my brain (even when I’m still half asleep) to focus on what I’m about to do. And since I am NOT a morning person, I need all the help I can get! I need a plan. If I don’t have some sort of idea what I’m going to read, I’ll spend the entire time flipping through my Bible in search of random passages. I’ve done all types of plans–chapter by chapter, topical studies, word studies, and most recently I read through the Bible chronologically. It doesn’t matter how simple or complex a plan you have, it’s just helpful to have one! There are hundreds–probably thousands–of reading plans available today in every format and on every topic imaginable. You can find a one-year plan here, or shorter plans here or here . And for you “non-readers” out there…if the thought of sitting down with a book (of any kind) makes you break out in a cold sweat, no worries! Download the YouVersion app and listen to the Bible while you go for a run, clean the house, or fold the laundry. Or find a devotional on Audible or Christian Audio and listen on your commute. 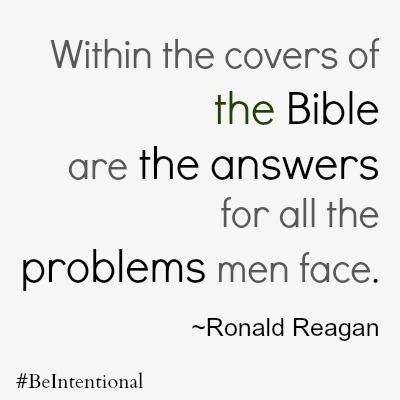 In what ways are you intentional about reading your Bible? Share your ideas in the comments, or join the conversation on Facebook or Twitter. Very good!!!! PRAY you have a Happy Healthy 2015. Reading the Bible is something I’ve struggled with my entire life. Of course, the older I get, the more wise I’ve become in understanding I can’t do this thing called life without God. What that means is I just have to as you said, be intentional, and do it. Every.Single.Day. It’s like exercise. It takes self-discipline. If I don’t do it first thing in the morning, I won’t do it at all. I’ll spend the rest of the day making excuses about how I’m so busy with this or that. I know myself. I know my weak zone. So I spend time with the Lord, digging into His word every morning after breakfast and right before hopping on the elliptical. The kids are at school (I only have 3 hours before my kindergartener comes home) and the house is quiet. No excuses. 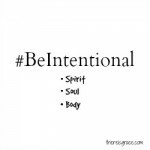 Now when summer arrives…well, that will be a whole new set of #beintentional rules. Such a good point! What a great parenting technique your father had. I love that. I have the YouVersion app that sends me a verse every day and I love it. Such an easy way to connect with God’s word and the app makes it so easy to dig deeper…wherever you are! Alli, I use YouVersion a lot…love it! What a great resource! Just wanted to let you know that I featured this post on Family Fun Friday this week over at Happy and Blessed Home. Thanks so much! Awesome! Thank you for you letting me know, Christen! I will be sure to drop by! I think it is great that your dad decided to use your inquiry as a lesson on looking to the Word for answers. Thanks for sharing! I loved your tips Nancy, they are great, thank you for sharing this wonderful content with us.